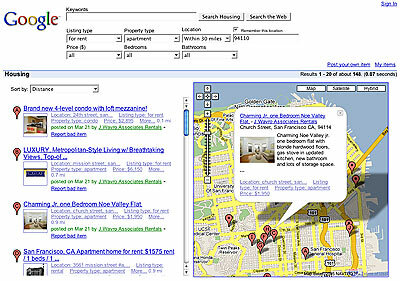 Google's got housing search in beta. To find it, go to Google.com and search for "apartment to rent". On the results page, use the form marked "Refine your search for apartment to rent" and you'll get a map like the picture above. Damn, that map is hella wonky. "Are there fact-checkers at The Chronicle?"